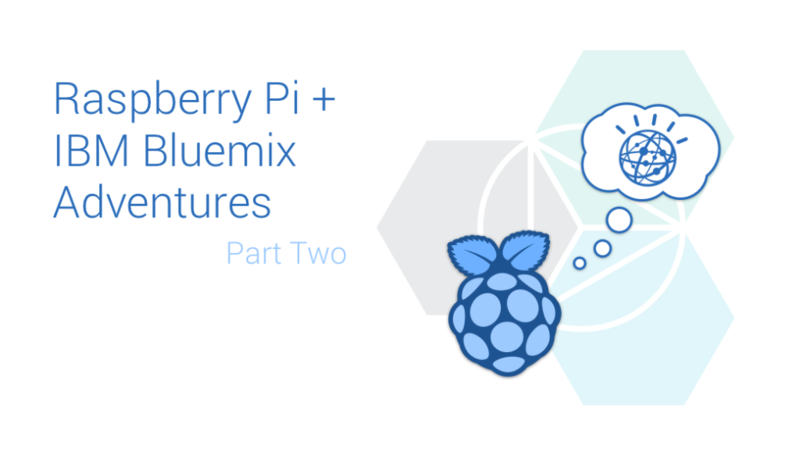 It turns out there’s a lot you can do with a Raspberry Pi and IBM Bluemix. 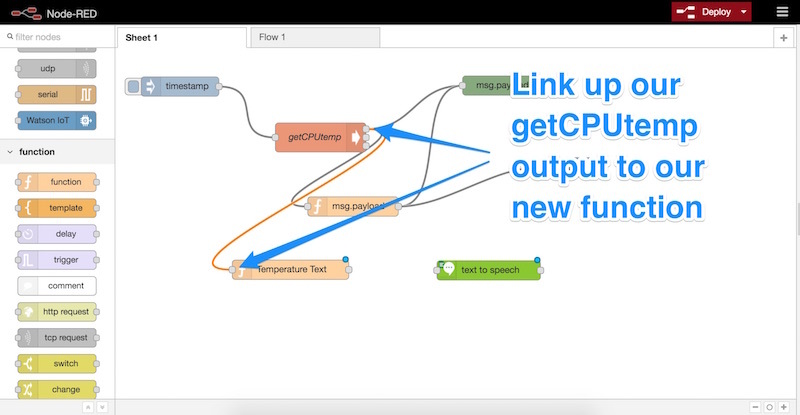 In the first article in this series, we explored how to connect up a Raspberry Pi to IBM Bluemix, IBM Watson and Node-RED. 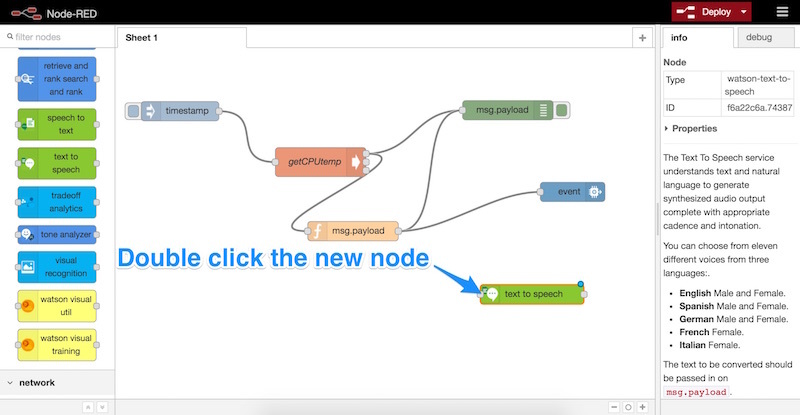 If you haven’t yet got your Raspberry Pi set up with Bluemix and Node-RED, go through part one first and then come back! I personally used a Raspberry Pi 3 for this, however I’ll assume a Raspberry Pi 2 can work just as well. 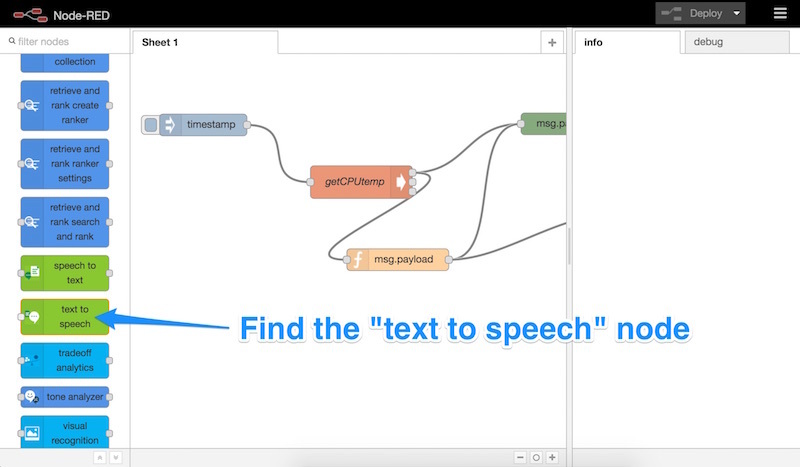 In this article, we are going to explore how to bring in text to speech to our Node-RED flow from the previous example. 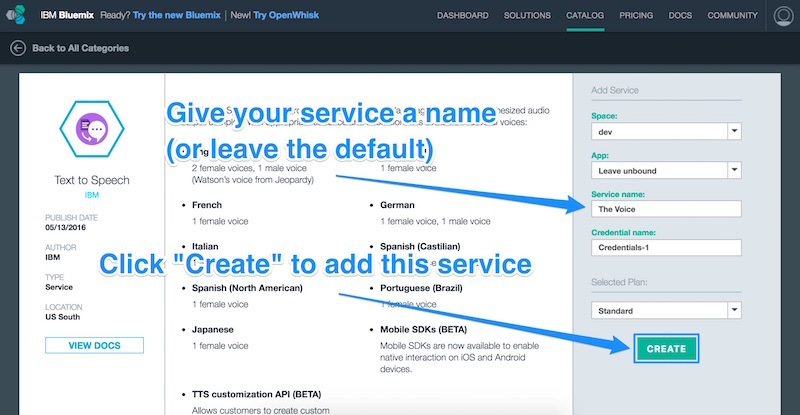 In order to have access to IBM Watson’s text to speech services, we need to add the “Text to Speech” service in Bluemix. 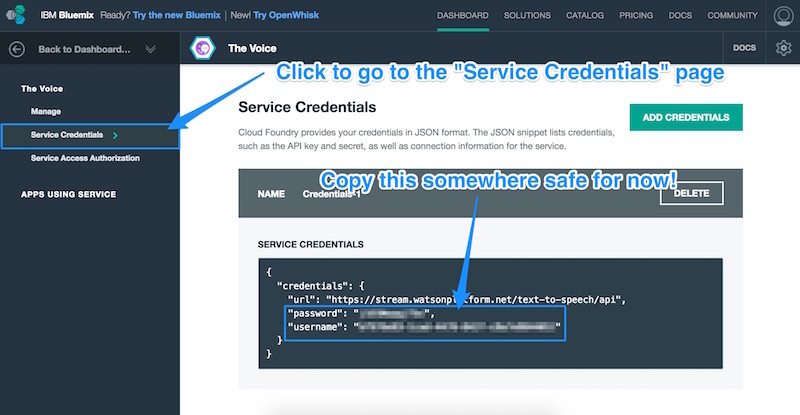 Let’s head over to the Bluemix Services page and find the “Text to Speech” service (be careful not to choose “Speech to Text”… that’s different!). 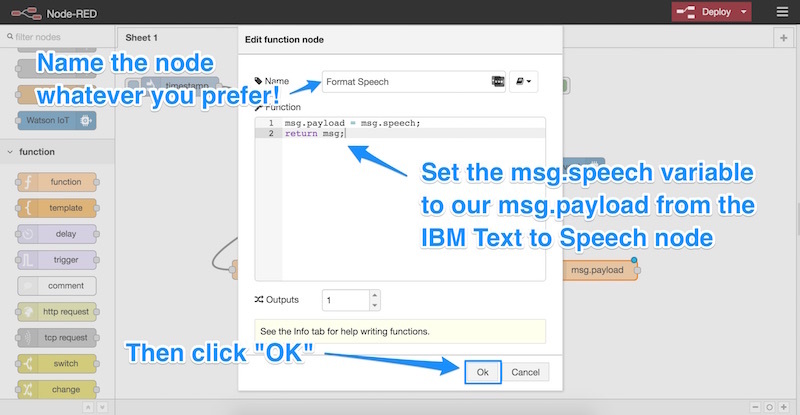 That should take us to the Text to Speech service Bluemix page. 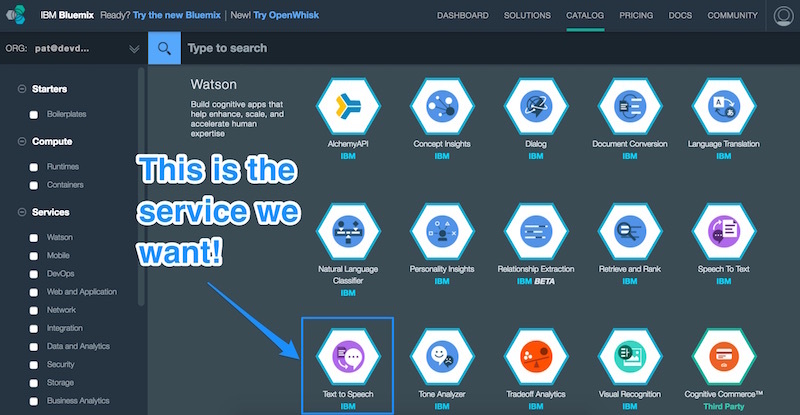 On that page, we’ll see various options for adding this service to our IBM Bluemix arsenal. We make sure our space that we are using for our Raspberry Pi is selected (I called mine “Dev” in the last article) and leave the app unbound. 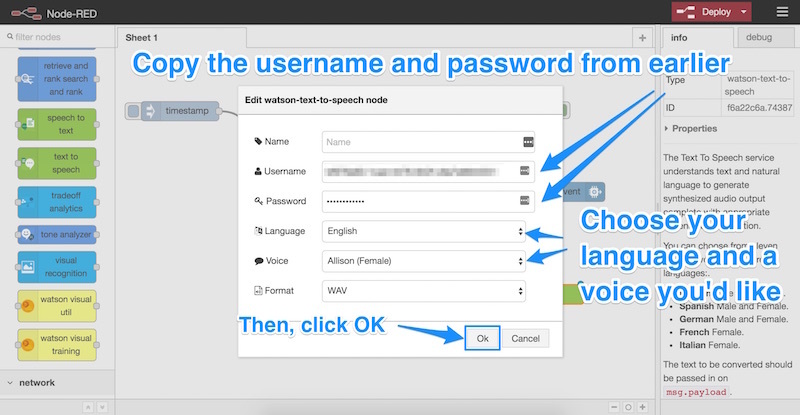 We can give the service a name (I called mine “The Voice”) and give the credentials a name (I left it as is). The only plan I had available was “Standard”, so I left that one as is too. Once we’re happy with our settings, we click “Create”. 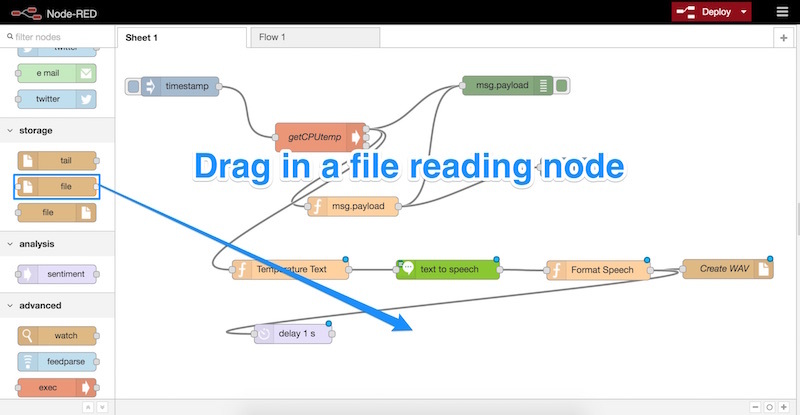 We now have all the parts in place to be able to perform text to speech and have it playback — it is now time to put these into Node-RED and get it to run. 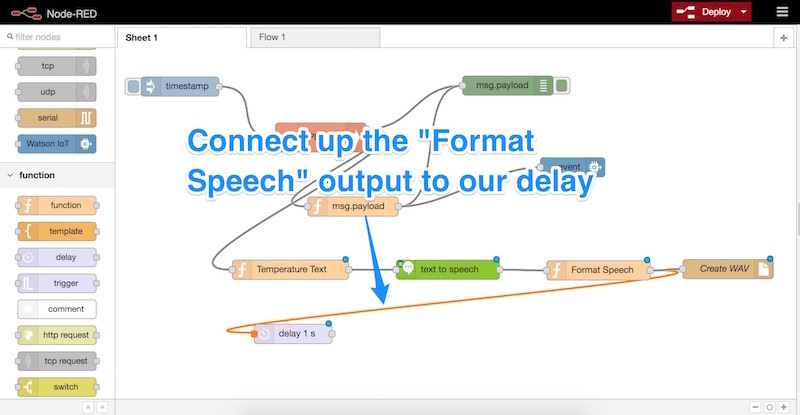 Our text to speech is ready to work its magic. We now need a way to tell it what to say. 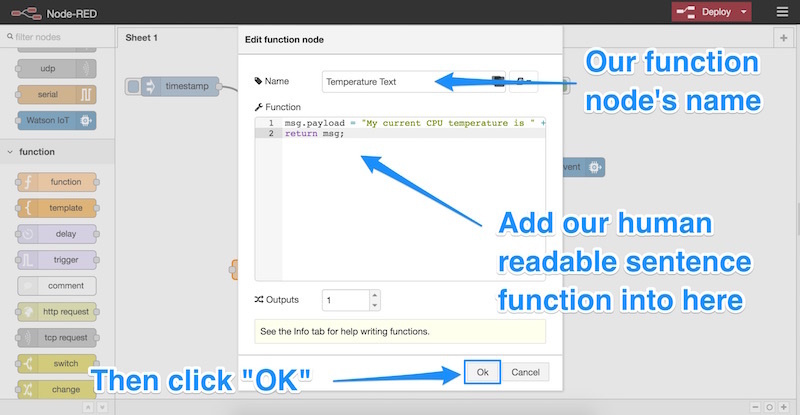 Lets get it to tell us what the temperature of our Pi is, just as we previously were sending to IBM Bluemix’s system in the last article. 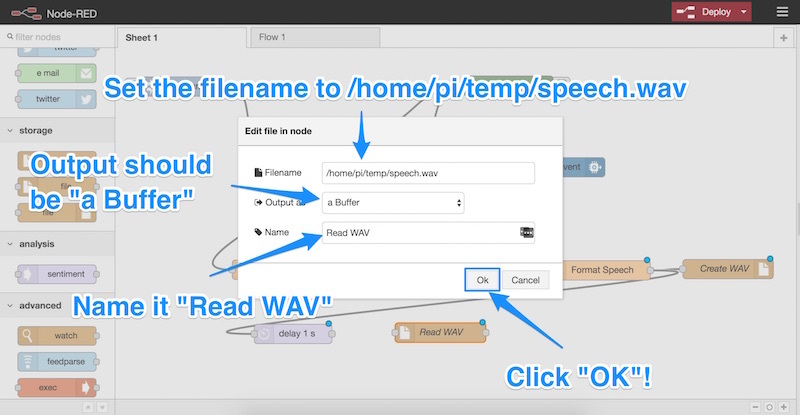 We set the filename to /home/pi/temp/speech.wav (where pi is the username currently running Node-RED). The action should be “overwrite file”. 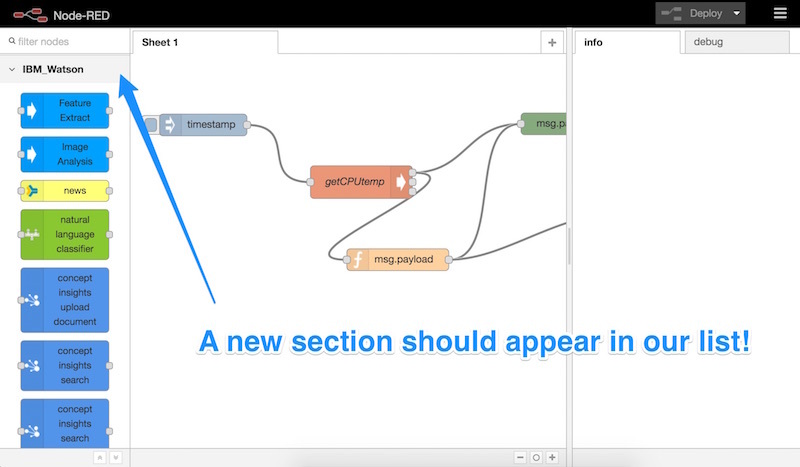 We ensure “Add newline (\n) to each payload?” is unchecked. “Create directory if it doesn’t exist” should be checked so that Node-RED can create a directory for the file if needed. We name our node — name it whatever you’d prefer! I named mine “Create WAV”. 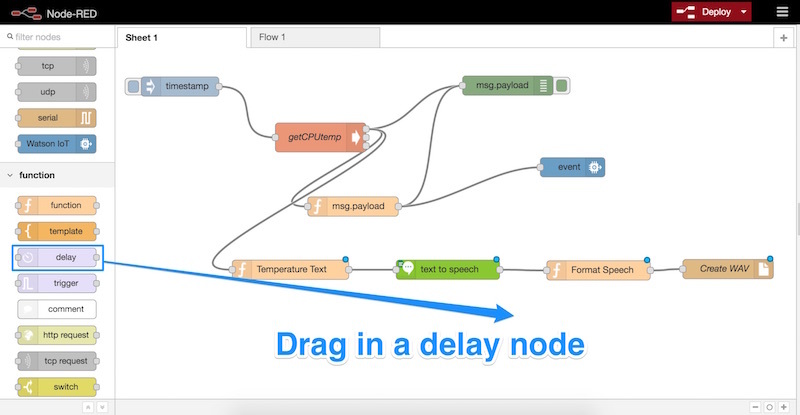 Now, we drag in a “delay” node. 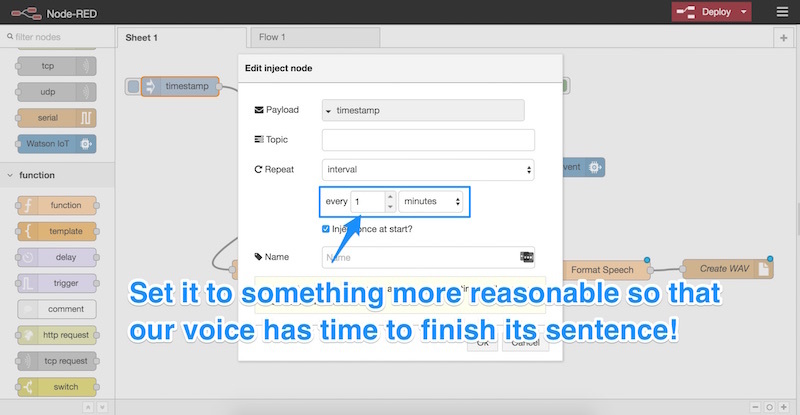 This will wait a little while for IBM Watson to have time to perform the text to speech before we try to play it. 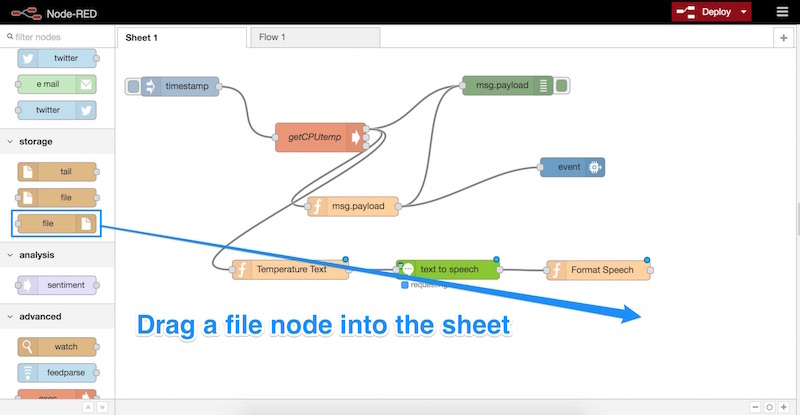 There are ways to run nodes in Node-RED when the sound file is updated but I found them to be a little buggy at times — a simple delay seemed to work best. 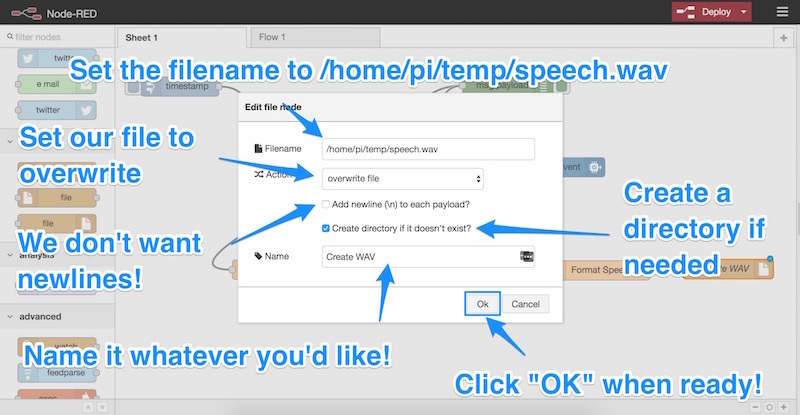 We set the filename to /home/pi/temp/speech.wav (the same as the one we had created earlier). We ensure the output is “a buffer”. We give it a name of “Read WAV” (this can be whatever you’d like to call it of course). 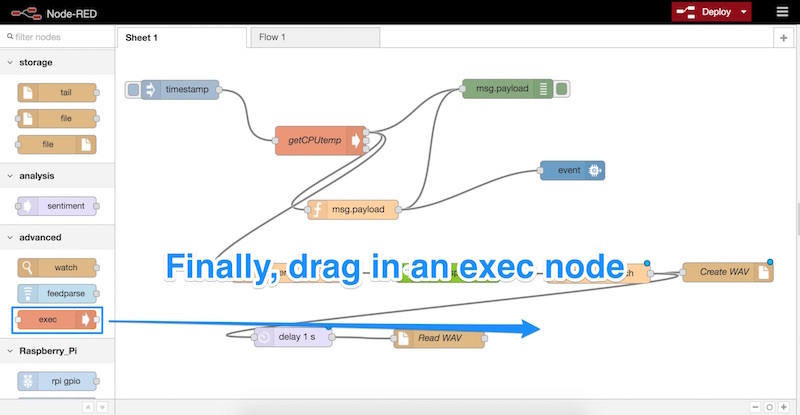 We connect up our delay node to the “Read WAV” node and then drag in our final node — the “exec” node. This one is underneath the “advanced” section and can run Unix commands. 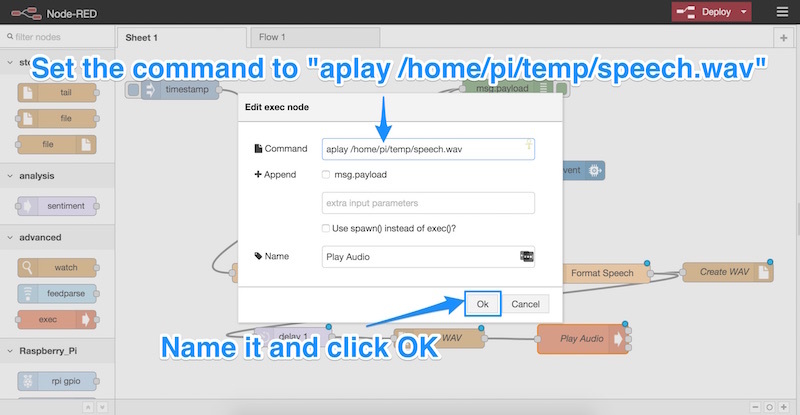 This is how we will play our audio on the Pi. You can find out more about changing your Raspberry Pi’s audio settings on the Raspberry Pi audio config page. 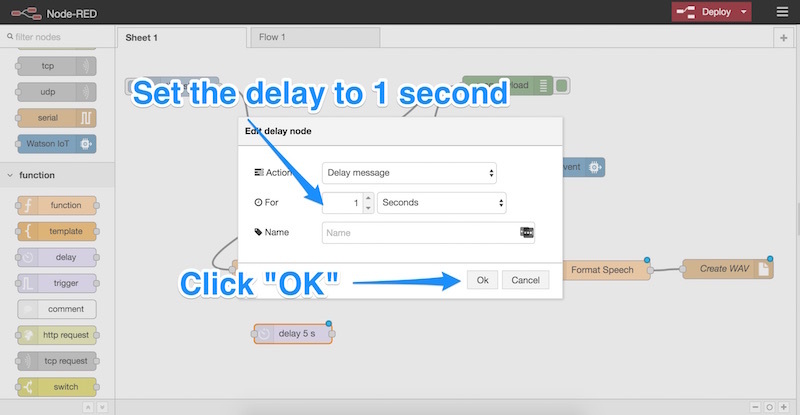 With the audio set up correctly and everything in place, click the “Deploy” button in the top right of your Node-RED interface. If all goes to plan, it should run successfully and your Raspberry Pi should begin speaking to you! 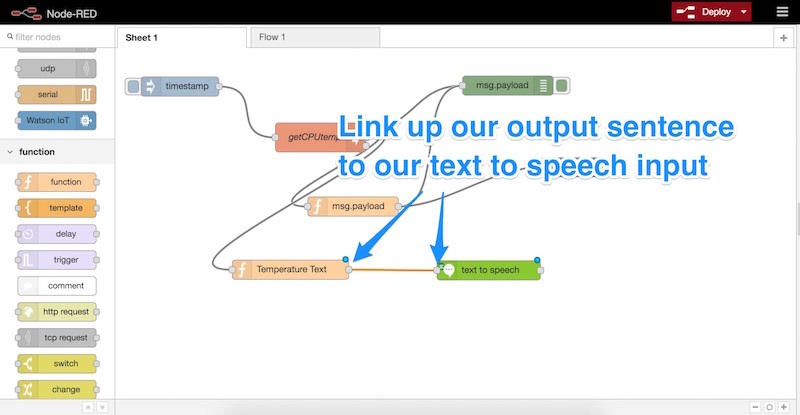 The IBM Watson text to speech capabilities bring a whole new set of possibilities for developers working with IBM Bluemix and the Raspberry Pi! 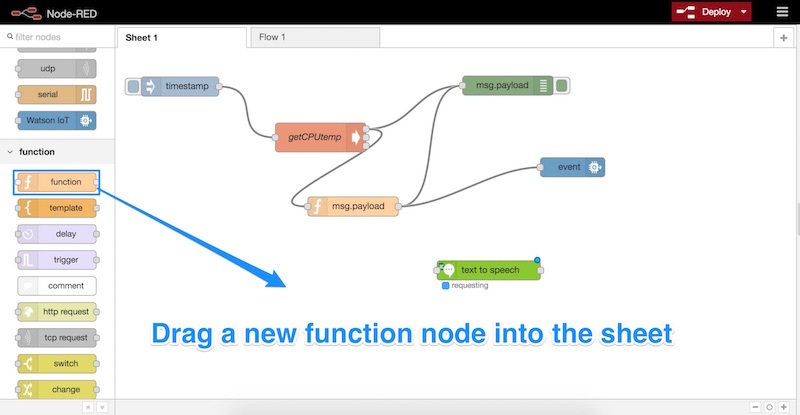 You could connect up the speech to almost anything, including other IBM Watson services. We will continue to explore more capabilities in the next article in this series, thank you to those currently following along! If you have been giving the Raspberry Pi and IBM Bluemix combo a go, I’d love to hear what you create with it! Let me know in the comments below, or get in touch with me on Twitter at @thatpatrickguy.